Apple’s iPhone is not nearing its end despite the company cutting sales forecasts, industry analysts have said. The technology giant saw its share price on the US stock market plummet by 10% on Thursday after telling shareholders it was lowering its revenue expectations for the quarter because of an economic slowdown in China affecting sales. But some industry experts have dismissed suggestions the slump signals the demise of the iPhone, Apple’s biggest-selling product. Ben Wood, chief of research at CCS Insight, said: “I believe it is wrong to call it the beginning of the end of the iPhone, but it’s definitely entering a new phase. In a letter to shareholders on the forecast change, Apple boss Tim Cook said that while the company had anticipated “some challenges” in emerging markets, it was surprised by the “magnitude” of the economic downturn in China, but also partly blamed increased tensions between the US and China over trade for the drop. 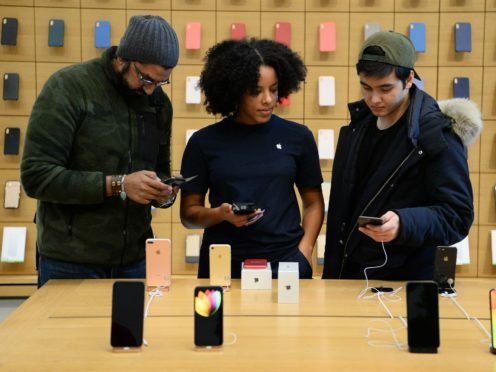 Mr Wood said the longer-lasting performance and higher starting prices of iPhone handsets were changing smartphone user attitudes, meaning many chose to keep their devices for longer. “In some ways, Apple should be commended for this, although shareholders won’t see it like that,” he said. “It has created products that have software upgrades that span five generations of products – so your iPhone does not go obsolete as fast as rival Android products – and it has allowed owners to get batteries replaced. The upside is that this all helps with loyalty to the iPhone franchise. “Also, it should be noted that Apple is the only mobile phone maker able to drive meaningful revenues over the lifetime of its products – be that through apps sales, subscriptions to Apple Music, iCloud subscriptions or other areas such as content sales. Julian Shovlin, founder of technology repair firm iSmash, added that a slowing of innovation in new smartphones also meant many were choosing to hold onto their current phone. “Over the past three years, there’s also been a noticeable slowdown in technological advancements in the mobile sector, meaning consumers are considering keeping their handsets for longer periods of time and aren’t as keen to immediately purchase the latest model as soon as it’s released,” he said. He added that all phone manufacturers were also coming under increased pressure from mid-range competitors offering similar features at lower prices. Apple was replaced by Huawei as the world’s second-biggest phone manufacturer last year and is also currently embroiled in a legal row over patent infringement with chipmaker Qualcomm, which despite threatening sales of some older iPhone handsets, Mr Wood does not see as a “barrier to Apple’s future growth”. The company has announced spending on its App Store between Christmas Eve and New Year’s Eve was more than 1.2 billion dollars (£947 million), including a single-day record of more than 322 million dollars (£254 million) on New Year’s Eve.